Why a Health First Roadmap? Numerous chemicals used commonly in cleaning products have insufficient public information available about how they may impact women’s health. Women are expected to trust that companies have conducted sufficient testing to ensure that products are safe before they enter the marketplace. However, these products can contain ingredients linked to such health impacts as fertility issues, asthma, and breast cancer. Increasingly, women are searching for safer products, and more companies are working to reduce health risks by taking a precautionary and transparent approach to chemical assessment and safety. Cleaning product companies that do not reduce their use of hazardous chemicals or report on their chemical footprint may incur consumer distrust and a loss of reputation associated with public scrutiny. Conversely, companies that use a health-first approach will benefit from growing marketing opportunities. The Health First Roadmap offers a framework and benchmarks as guidance to cleaning product companies for chemical screening and safety. Why Should Your Company Use this Chemicals Management Approach? Women are increasingly concerned about the presence of harmful chemicals in the products they use in their homes and workplaces. The prevalence of claims such as paraben-free, formaldehyde-free, and fragrance-free are just a few examples of the market shifting toward “natural” or “green” products, now a $180 billion industry. Women are wise to the fact that marketing claims alone do not ensure that a product is safe. They want to know that manufacturers have a comprehensive approach to ensure that these products are safe for their families. Elva Aguilar has worked as a domestic cleaner for over 15 years. When she became sick, the lack of health and safety information on ingredients in cleaning products was very problematic. Without this information, medical professionals had a difficult time determining whether her illness was from exposure to chemicals in products she used. Because the safety of the chemicals in the products Aguilar used was in question, she now runs her business using cleaning products she makes herself with ingredients she knows to be safer. Thousands of cleaning workers in both domestic and commercial settings are exposed to chemicals about which little is publicly known. Most workers do not have the freedom to choose to use green brands in their workplaces, and fewer still can make their own products. For this reason, it is critical that chemical screening criteria and safety data are made public. Leading brands in the cleaning products industry are beginning to understand that transparency is a way to build consumer trust. Accessibility and affordability are key concerns in low-income communities, where brand trust is just as important as in more affluent areas. Easy access to safer product options remains limited in these communities. Often referred to as “food deserts,” communities with little to no availability of healthy and nutritious food also tend to have limited options of alternatives to conventional cleaning products. Without options like fragrance-free products and “green brands,” women in these communities can choose only among conventional brands. When alternatives are available, often these products are more expensive and therefore may be unaffordable. Another concern in low-income communities and across the country are the increasingly common discount retailers, or “dollar stores.” These stores offer very inexpensive products but offer little if any information about the ingredients in non-brand name products. This is in stark contrast to the major cleaning product brands that now share ingredient information and at least some public statement about their commitment to product safety. Recent product testing of toys and other plastic goods from dollar stores revealed the presence of harmful chemicals and heavy metals, drawing closer scrutiny to the standards and practices of discount retail corporations. Brands sold in dollar stores can improve by sharing publicly how they ensure that the chemicals they use in products have been thoroughly tested for safety. 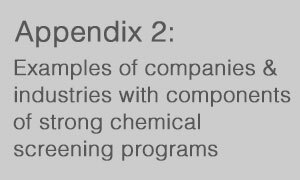 Companies that do not improve their products by reducing the use of hazardous chemicals may experience significant business impacts. In its first annual report, the Chemical Footprint Project outlined three distinct risks companies face. The first encompasses regulatory risks associated with lack of compliance with new regulations or enforcement of existing ones, which may result in product recalls and fines. Redesign risks can impact companies that continue to use hazardous chemicals. These costs include the significant resources involved in reformulating products and the risk of losing market share to a competing brand. All companies in the cleaning products industry also face reputational risk associated with having ingredients of concern or hazardous contaminants in products exposed by a NGO. 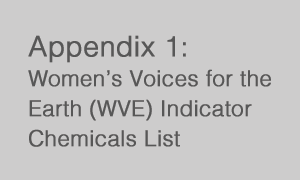 For example, Women’s Voices for the Earth’s 2008 report Dirty Secrets: What’s Hiding in Your Cleaning Products? revealed the results of independent laboratory testing that identified the presence of hazardous chemicals including phthalates, toluene, and 1,4-dioxane. Since the launch of WVE’s Safe Cleaning Products Initiative in 2007, all four major cleaning product companies have made progress in removing certain hazardous chemicals, including: nonylphenol ethoxylate– a particularly harmful alkyl phenol ethoxylate (APE); phthalates; 2-butoxyethanol; and Triclosan. In addition, Clorox and RB no longer use synthetic musks. Reputational risks to companies are amplified by the tens of thousands of women nationwide who are demanding products free from these and other chemicals that increase their risk for certain health problems. Recent examples in the news underscore this reality. One recent case involves a class action lawsuit and recent jury decisions awarded to women who used Johnson & Johnson’s (J&J) baby powder with talc. Company documents made public through these proceedings revealed that the potential dangers of talc when used genitally were known to the company for 30 years. In addition, J&J criticized the data pointing to talc’s links to ovarian cancer, citing biased study methods and pointing to the lack of definitive data proving talc’s harm. Jury verdicts in four out of five trials thus far have ordered J&J and its talc supplier to pay a total of $307 million. Another example of reputational risk is the March-December 2015 plunge in Lumber Liquidators’ stock price over public concern that their flooring products contained formaldehyde. A feature on 60 Minutes and numerous stories in print media revealed that products imported from China by the flooring manufacturing giant contained greater levels of formaldehyde gas than is allowed by U.S. law. Lumber Liquidators agreed to pay $13 million for its illegal imports. Its stock dropped 79% after the 60 Minutes feature aired, and store sales declined by over 17%. J&J and Lumber Liquidators are only two of many cases that demonstrate the risks to companies that do not meet consumer demand for safe products, and are not transparent about how they determine safety. Oxy, a cleaning products manufacturer in South Korea, launched a humidifier disinfectant product in 1996. The company did not employ a robust chemical screening program and therefore did not assess the respiratory toxicity of the active ingredient. While the ingredient was effective at eliminating bacteria, it was also aerosolized by the humidifiers and caused respiratory harm to thousands of people who used the product as directed. Fifteen years passed, including a takeover of Oxy by another manufacturer and several similar products offered by other manufacturers. None of these companies conducted respiratory toxicity screening, which would have identified the significant health hazard associated with the product. The tragic result was hundreds of confirmed deaths and thousands of injuries to customers. The financial costs to the manufacturers have been staggering, including multi-million-dollar compensation schemes and in some cases, the loss of their entire Korean market due to boycott activity. Both the tragic loss of human life and health and the financial costs would have been fully preventable with robust chemical screening and the selection of a safer active ingredient from the start. With greater consumer demand for products free of harmful chemicals, cleaning product brands have an opportunity to avoid these risks. Major manufacturers have responded to this demand by increasing product-specific ingredient disclosure and removing high profile chemicals of concern such as 2-butoxyethanol, phthalates, Triclosan, and galaxolide. These brands have benefited from disclosing ingredients and removing hazardous chemicals. Companies that have announced broad commitments have enjoyed positive media coverage and support from NGOs, which translates to increased consumer trust. While ingredient disclosure is central to this trust, it is just the first step. Consumers also want to know if companies are taking comprehensive steps to ensure that products are safe for human health and the environment. How Does Your Company Decide What Is Safe? ingredients are evaluated and deemed safe to use. The definition of what constitutes a “safe” product is subjective, and consumers are asking whether a company’s definition matches their own. To a growing number of women, “safe” products are those that do not contain chemicals linked to cancer, reproductive and developmental harm, endocrine disruption, and do not harm the environment. In addition, women also expect companies to maintain a high bar for the chemicals they will use in their products. Placing the “burden of proof” on the side of a chemical’s evidence of safety, rather than conclusive evidence of its harm, women are looking to companies to more carefully screen the chemicals allowed in its products. This is particularly important because of the lack of publicly available safety data on numerous chemicals commonly used in cleaning products. By taking such steps, companies are moving towards offering safer products using the least hazardous chemicals available. Whether a woman is pregnant and is therefore concerned about chemicals that could impact a fetus or is working to avoid workplace chemicals associated with cancer, she needs to have the information to determine whether the product she is buying is safe for the issues of specific concern to her. Currently, no company in the cleaning products sector is fully transparent about how it manages chemicals and ensures that it is using safe ingredients. In recent years, the Chemical Footprint Project (CFP) has emerged as a trusted third-party process that offers a framework for companies to assess their chemicals management practices, measure their reduction in the use of chemicals of high concern, and report publicly on the results. Supported by NGOs including Women’s Voices for the Earth and major retailers such as Walmart, Staples, and CVS, CFP has just released its second annual report and is gaining attention from investors, institutional purchasers, government agencies, and consumer advocates. WVE’s 2015 report Deep Clean: What Cleaning Companies Should Be Doing to Protect Your Health offered four major cleaning product manufacturers the opportunity to describe their chemical screening process and criteria. The report offered examples of useful resources developed by third-party such as the BizNGO Guide to Safer Chemicals and certifications such as USEPA’s Safer Choice. The participating companies did not supply sufficient information about their chemical screening processes to achieve higher than a C+ grade. Deep Clean also noted the importance of companies developing and tracking progress towards ingredient safety goals. Annual sustainability reporting that companies already provide for investors and the public should include information on and progress towards these goals. The framework and benchmarks included in the Health First Roadmap are intended to provide more specific guidance to cleaning product companies on chemical screening and safety. This roadmap outlines the key categories included in company chemical screening, and benchmarks from “square one” to the “high road” the ways companies can make progress towards an approach that puts health first. Examples from the retail, electronic, and apparel industries are provided to demonstrate the efforts that some major corporations have made to adopt and disclose strong chemicals evaluation processes. The emphasis on public transparency of chemical screening methods cannot be overstated. The Roadmap identifies where and how companies can disclose information about their screening processes and report on their progress towards their chemical safety goals. Currently, no company in the cleaning products sector is fully transparent about how it manages chemicals and ensures that it is using safe ingredients. This is both a serious problem for public health and for companies that are committed to building consumer trust. Read more. 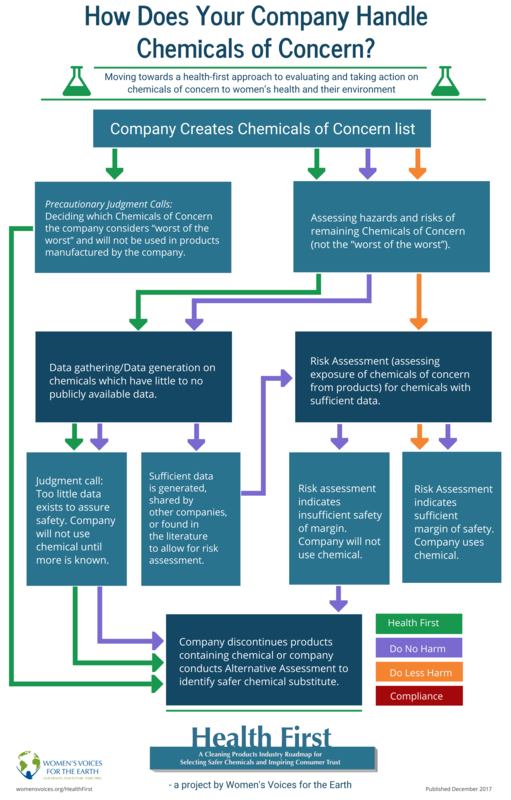 Flowchart: How Does Your Company Handle Chemicals of Concern? The Health First Roadmap is the result of the combined talents of Sarada Tangirala (lead author) and Alexandra Scranton, with editorial review provided by Jamie McConnell, Erin Switalski, and Beth Conway.